When I executed my project, a brick border become visible all the time. If you look at my post (https://forums.unrealengine.com/unre...87#post1485087) you should be able to fix this by adding T_White to the two main structs in the Chameleon/Structures folder. All working fine for me now (I upgraded from 4.17.2 to 4.19). I think there's some kind of bug in the latest versions of the engine causing confusion on structs. I'm saying this because this is a 10th update of the Chameleon and also this is the first time experiencing this type of behavior. Still working on it to understand the real problem here. Thankfully, however, as you mentioned there is a workaround by simply replacing the missing textures with T_White on both structs. As an addition to Rob McLachlan's answer, please also update to the latest version of the Chameleon by the Launcher and after that, add the new files to the project. I checked AdvancedEffectFeatures and AdvancedEffectFeaturesNoCustomDepth. Both have T_White. BTW, I updated Chameleon from Epic Launcher and replaced the BP and now it works fine. 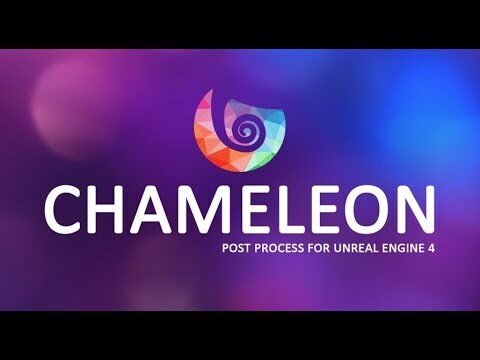 In case of you fellow devs interested, I have just published the Chameleon Post Process 10.0 | Effects Showcase video. Chameleon is not a simple post-processing material library. Its materials were designed to work with the provided blueprint. You can still make those materials to work standalone but most likely you would need to modify the parameter(s) as well. Thanks to answer, but can you point me to what parameter(s)? need I use advanced effects features? or put random numbers each tick in offset and speed is enought? Make something more modular will be great, like for example each postprocess be a component. Last edited by DomusLudus; 07-23-2018, 10:01 AM. I've a small problem with overwriting post process effects on the level. I have a mesh with glass texture that is in front of the character affected by Chameleon Post Process, Neon effect. What I want to achieve here is that, when the character walks past the glass mesh, he will be highlighted... or vice versa. Last edited by Coverop; 07-24-2018, 11:23 AM. I'm on my way home (I was on vacation) If you can give me a day or two I can come up with something which may help you. What you would need to do is bypassing two nodes in material. However, this doesn't work with translucent materials since no depth information is written to buffer. Hey, thank you! I'll see what I can do about it. I'm having some issues selectively applying anamorphic flares to scene objects. I have the stencil buffer enabled in proj settings and can get the object to highlight using the Custom Depth Highlighter as a test, but the flares are being clipped by the depth buffer. So what I want to do is apply flares *after* the buffer rather than have the buffer clip them off. This is a transparent particle system, but I have Allow Custom Depth Writes enabled in the material and I can see that they're affecting the particles within the buffer - just not outside of it which is what I want.